Rank badges, trade badges, insignia and other details can be difficult to reproduce convincingly by painting. All of the figures I have painted in the photos in the figures list and Gallery have transfers (decals) applied for cap badges, rank badges etc. I make my own transfers using either white or clear transfer paper. A good quality printer is also helpful. If you have not tried making your own transfers before it is relatively easy. I obtain my transfer paper from Crafty Computer Paper (www.craftycomputerpaper.co.uk). They supply waterslide transfer paper in A4 sheets for inkjet printers and laser jets. They also supply rub-down dry transfer paper. Simply select the correct paper for the type of printer you have. I prefer to use clear paper. For PC users, create a document in Word (or whatever alternative file format of your choice). Right click and "save" the artwork below onto your computer. Paste the artwork into your document and then print the document onto transfer paper. Mac users are far more intelligent than the rest of us and so I won't patronise them by suggesting how they might create and print a document! The artwork is A6 size (which is a quarter of A4). So if you don't want to waste transfer paper cut it into quarters before you print. If you're going to do this don't forget to set your printer to print on A6 paper. Your printer should be set on "best quality" or "max DPI" to get the optimum results. When the ink is thoroughly dry, I tend to give the transfer paper a light coat of varnish (Kleer) in order to seal the surface. A spray fixing agent can also be used. Crafty Computer Paper supply some which I have used with success. To use the transfers (waterslide) cut out the item you want to use from the transfer paper. I use a sharp scalpel. The figure needs to be prepared. Using clear transfer paper requires the area where the transfer is to be applied to be painted white (bear in mind that your printer does not print white ink – the "white" in the images on the transfer paper is the background colour of the paper). The artwork is designed with the background colour behind the badge or insignia (unless the background colour is white and in which case the background is left clear). I give the figure a light coat of gloss varnish (Kleer) where the transfer is to be applied. I apply the transfer whilst the varnish is still wet and then give a further coat of varnish on top of the transfer. When the transfer (and varnish) is completely dry, I touch up the paint around the badge/insignia to paint over any white remaining and to blend in the transfer with the background. I finish off with a coat of matt varnish. We intend to add to the artwork as the Gunthwaite range grows. The version of the artwork for download below may be amended from time to time. This artwork is provided for personal use only. It must not be reproduced for re-sale or other personal or commercial gain. Cap tallies: H.M.S. (Royal Navy); H.M.A.S. (Royal Australian Navy); H.M.C.S. (Royal Canadian Navy); H.M.N.Z.S. (Royal New Zealand Navy) H.M.M.T.B. (Motor Torpedo Boat); H.M.M.G.B. (Motor Gun Boat). Officer cap badges; Officer cap badges for white cap cover. 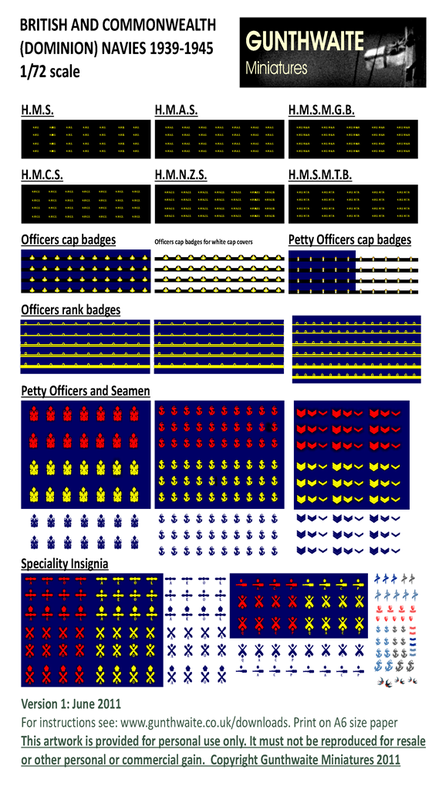 Petty Officer cap badges; Petty Officer cap badges for white cap cover. Artwork copyright Gunthwaite Miniatures 2011.